If you are not familiar with what a blog hop is, it’s fun and easy to follow! Simply click on the first photo in the list below to visit the blogs of those who are participating. Each blog will have the same list of links on their blogs and you just follow them in order to go to the next blog! Please keep in mind that the following sponsors have agreed to donate a portion of their sales during this hop to the Coffee Oasis so please visit them and remember that if you place an order, you will be donating and supporting Coffee Oasis as well! These sponsors are also providing prizes to the hoppers as well! Kat Scrappiness is offering 15% off EVERYTHING IN THE STORE and is donating 15% of all sales during this blog hop to Coffee Oasis! Use coupon code: COFFEEOASIS to save! We are also giving away gift packages! 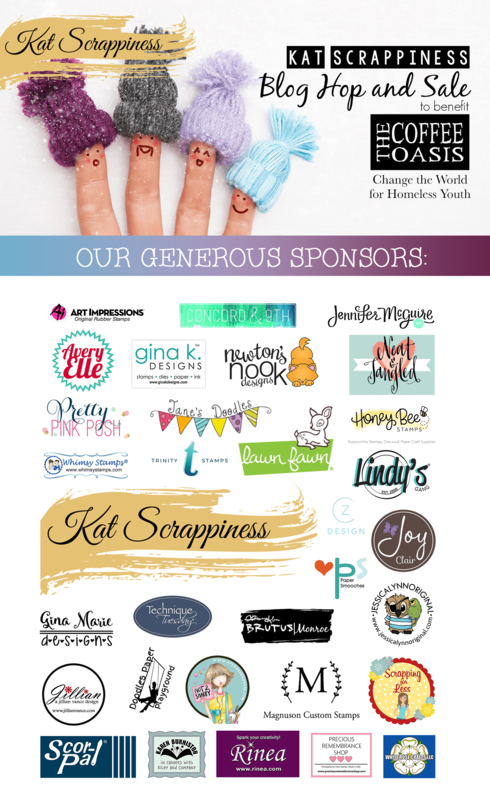 Kat Scrappiness – is offering 15% off EVERYTHING IN THE STORE and is donating 15% of all sales during this blog hop to Coffee Oasis! Use coupon code: COFFEEOASIS to save! We are also giving away FOUR gift packages, each valued at $25.00 or MORE! We also have a care package from HERO ARTS to give away! Magnuson Custom Stamps – One FREE Custom Made Stamp! Not2Shabby Shop – Five (5) Coffee First stamp sets. Scor-Pal – Three Gift Packs with products such as the Full Size Scor Pal, Scor-Tape and the Scor-Bug Embosser. Let’s get hopping and spread the word to see how much we can help this wonderful organization. Don’t forget that you can join the hop but clicking on the “Add Your Link” button and uploading a photo of your Winter Themed Card! Join us for the fun! It all starts with one person and then it can grow into something wonderful. That is the magic of Christmas. What an awesome blog hop! 🙂 Can’t wait to see all of the amazing talent. Love blog hops, they are so inspiring and especially ones that benefit such a great cause. Thanks, Kat and all the wonderful sponsors. Wonderful idea! Looks forward to seeing what the designers come up with. Thankbyou so much for organizing this blog hop and spreading awareness! Can’t wait to check out everyone’s blogs/Youtube’s. GREAT CAUSE and GREAT HOP! Can’t wait to comment! My page isn’t listed… can someone help? Posted it in the FB page…. Thank you so much for hosting this hop for this great cause!!! Thank you to all these amazing Sponsors too!!! Can’t wait to see all the fabulous creations!!! What an awesome BlogHop! I hope that a lot of money is raised or this benefit. I can’t wait to see all of the creations! Thanks to all that are sponsoring this hop. Great hop for a great cause. Awesome! Great hop for a great cause! Super hop for a worthy cause! Yay! Such a fun hop and a fabulous cause! So happy to be part of the fun! What a good cause good luck with this blog hop! Already made a purchase at Trinity Stamps! So happy to hear that 10% will go to such a fantastic place! Thank you! Such fun! Thanks for organizing. What a great idea for a blog hop! I hope that a lot of money is donated. Thank you for doing this. I am from Washinton and was a resident in Kitsap for 15 years so this cause really caught my attention. Looking forward to the hop. What a great cause! Such a generous group. Can’t wait to see everyone’s cards. Looking forward to some inspiration! I can’t get the blog hop to work. I’ve tried to click on each picture but it won’t take me to their blog. What am I doing wrong? I can’t wait to see all the cards. A Big Thank You to everyone participating in this great cause. First time I’ve seen and understood a blog hop. This is great!! What a great cause!!! So many young people need our help!! Can’t wait to see all the beautiful creations! Love the idea of this blog hop helping young people who are struggling… great cause. Looks like a great list of creators for this blog hop. I love blog hops where I can get great ideas. What a great blog hop! Tons of inspiration. I hope you get lots of support for the kids. This is such a nice thing to do for someone. May God Bless this hop and provide abundantly for the cause. I love this blog hop. Great! I love crafting but crafting for a cause is even better. I love Washington. It’s such a beautiful state. Thank you to all of the contributors. Thank you for supporting a great cause and inspiring us all with these gorgeous projects! Off to hop! How very kind and generous you are to host this hop for such a worthy cause. This is the true spirit of the season. Cheers. Can’t wait to see everyone’s designs. Going hopping! Can’t wait to get all kinds of inspiration! Great way raise money for kids in need! Wonderful inspiration to do something for others! What a wonderful way to spread love at this special time of year! beautiful! so many could benefit from this! Awesome hop, thanks for putting this together Kat! Great hop for a great cause! Thank you for organizing it! So glad to be part of this Hop and Cause ! Fabulous Cause and hop! Thank you for organizing it all. A great idea for a blog hop! Fabulous cause…hope I can participate and bring awareness to this charity. What a great cause you supporting! I hope you do well on the fundraising. What a wonderful cause!! Good luck!! Can’t wait to see some new inspiration!! What a wonderful idea to help support an amazing organization. Thanks for caring! Such a unique card with such a beautiful message. Such a fantastic hop and great cause! I’m glad I could be a part of it. Wonderful hop for a good cause. Great hop for a great cause! Thank you for organizing this and a big thank you to all the sponsors. You are AWESOME!!! This is such a worthy cause to support. Thanks to all for their involvement and to the generous sponsors and donators. Thanks for putting on this great hop! thanks for hosting such an amazing hop! !